You're already familiar with vintage furniture and antiques -- you may even have a few pieces in your house already. But maybe it's time to take retro to the next level by incorporating vintage ceilings, cabinets, hardware, and more. 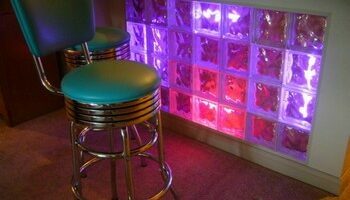 Here, homeowners share their favorite ways to incorporate retro items into home decor. Vintage Christmas ornaments are highly collectible and harder to come by as time moves on. Keep your eyes peeled at yard sales and search online. Here are some links where to find some of them and reminders of Christmas ornaments from half a century ago and a few others thrown in just for fun. What Do You Do With Your Old License Plate? You’ve got to see this garage that’s covered in old license plates from all over the country. It’s definitely not something that you see everyday. Kick it up a notch in your retro room decor by adding a pair of restored vintage drive-in movie speakers complete with stand. 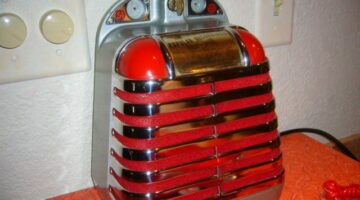 I recently saw a restored Solotone Entertainer coin operated jukebox speaker that dates to the 1940’s. It’s a great little example of corded Americana. Eating out while eating in is made possible when you have your very own 50’s-era reproduction diner in your home. Authentic materials and ideas make it fun. I’ve laid my hands and eyes upon a beautiful piece of nostalgia from 1955. 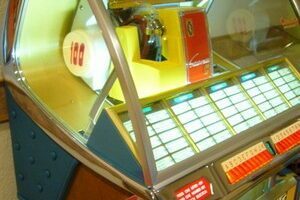 It’s called a Seeburg Model 100 J jukebox and it sounds great!